This rocks! Scientists invent t-shirt that can charge up your mobile phone | UNBELIEVABLE! Don’t you just hate it when you’re at a music festival and your phone battery dies? Fear no longer. Scientists have invented a t-shirt that can recharge your mobile phone. (Yes, you read that correctly: a t-shirt that can recharge your mobile phone). The shirt contains a piezoelectric film panel, which absorbs compressed sound waves. The panel then converts these waves into an electric charge, which powers up the mobile phone. So all you need to do is plug your phone into your shirt, stand in the crowd, rock out to the band – and, hey presto, your phone will charge itself up. 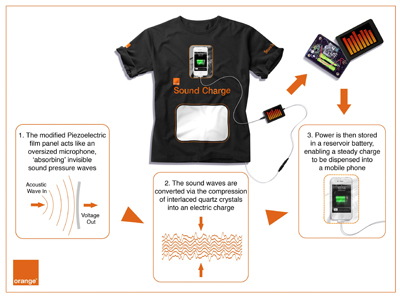 The shirt, endorsed by Orange and called the Sound Charge, is set to be tested at this year’s Glastonbury festival. With average noise levels of 80 dB, Orange say the weekend sound will produce enough aural stimulation to charge even your smartphone. Posted on June 20, 2011, in Technology and tagged Energy, Glastonbury, Music, Orange, Piezoelectric film, Rock festivals, Smartphones, Sound Charge T-shirt. Bookmark the permalink. Leave a comment.